Today, Dale Thrush, Director of Planning & Economic Developmen, in Councilmember Wendy Greuel's office sent an email to Sunland-Tujunga neighborhood council members, giving locals an update on that old Kmart property, the site that was supposed to hold a Home Depot till everyone successfully chased the chain out of town. And surprise, surprise, there's talk of a Target. Excerpt of Thrush's email: "We have talked to the brokers who are marketing Home Depot's lease on the property. We have also talked to a variety of potential users for this site, and there is a great deal of interest. One potential user in particular is interested in buying the property and creating a town center project on the site. This project could include a general merchandise store such as Target, a bookstore, restaurants, community college classrooms and other shops." [More of his email after the jump] After disputes with the city about whether or not an environmental review process was needed, Home Depot announced last month it was pulling out of the area. Home Depot spokeswoman Kathryn Gallagher told KPCC: “It’s twofold. Given the steps required by the city as well as the current economic landscape, and both of those just point to the fact that it just simply doesn’t make sense, business sense, for us to pursue this project.” According to KPCC, oppponents had worried would the store "would drive out small hardware stores and hurt the local environment." 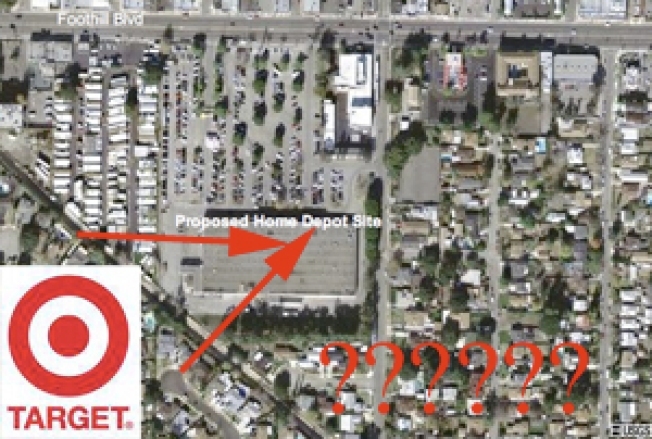 If residents didn't want a Home Depot, are they going to want a Target? Perhaps not. Who knows how long it's been up, but here's a bare bones No Target in Sunland-Tujunga web site. appropriate businesses to the K-Mart property. restaurants, community college classrooms and other shops. meeting to discuss the community's preferences. status of the property can be clarified.